God of blacksmiths, craftsmen, artisans, sculptors, metals, metallurgy, fire and volcanoes. 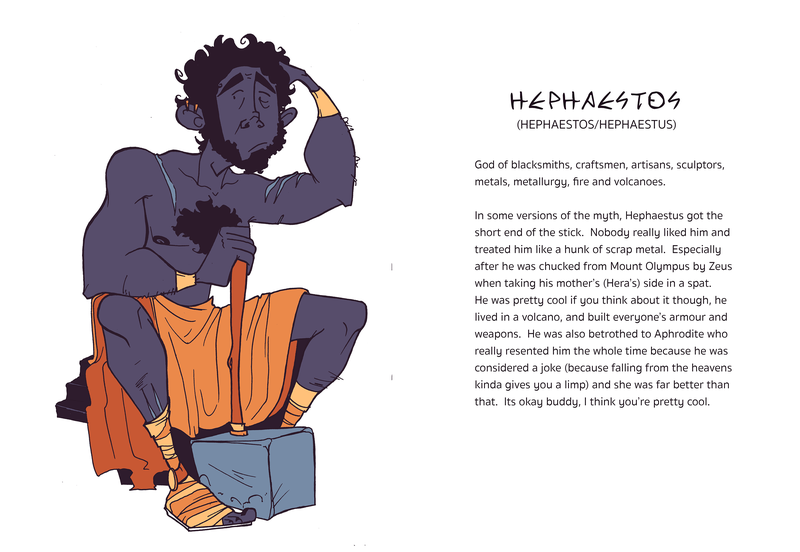 In some versions of the myth, Hephaestus got the short end of the stick. Nobody really liked him and treated him like a hunk of scrap metal. Especially after he was chucked from Mount Olympus by Zeus when taking his mother’s (Hera’s) side in a spat. He was pretty cool if you think about it though, he lived in a volcano, and built everyone’s armour and weapons. He was also betrothed to Aphrodite who really resented him the whole time because he was considered a joke (because falling from the heavens kinda gives you a limp) and she was far better than that. Its okay buddy, I think you’re pretty cool.